Personalized 8x12 Slate Pineapple Welcome Plaque - - 8" x 12" stone Pineapple Welcome sign personalized with your name, an address, or alternate text. Made in USA. 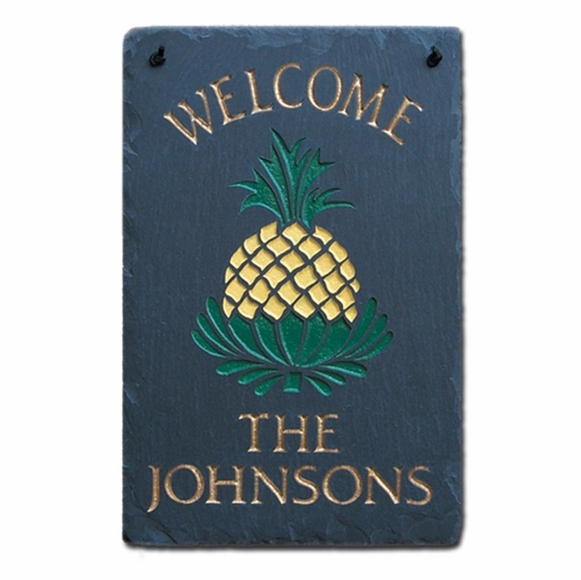 The word "WELCOME" comes standard on this plaque and is placed above a golden ripe pineapple. Line 1 holds up to five characters (including spaces). Thank you to customer PG of Glendale, AZ, for sending in the photo of her welcome sign in the small image above (click it to enlarge). We ordered this slate plaque to sit outside my mom's apartment. It's a nice size and the engraving and design are well done.